There is always more that we can learn on the drums, but it’s often difficult to choose the next step to take. This comprehensive training pack includes easy step-by-step lessons so you can improve at your own pace. The whole pack includes: 20 step-by-step training DVDs, 21 play-along CDs, and 5 spiral-bound workbooks. Covers classic rock, hard rock, heavy metal, grunge rock, progressive rock, punk rock, blues, country, odd time, shuffles, funk, Latin, jazz, and more. Four-way split screen video ensures you see everything. On-screen sheet music with a blue bar marking progress. Drum-less play-along songs with and without a metronome. Companion workbooks that make it easy to follow along. Drum Soloing – DVD 16. Have you ever wanted to play an amazing drum solo? 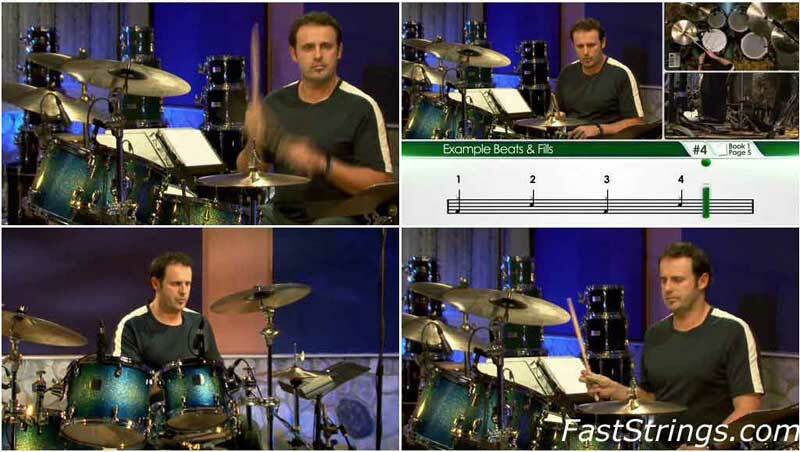 Maybe you have watched some of your favorite drummers play, and wondered how they were able to be so creative. Well, this DVD will show you all the different aspects of creating and playing a unique drum solo. Drum Play-Along 1 – DVD 17. Half the fun of learning the drums is being able to play with a band, so the Drumming System includes a huge selection of play-alongs. There are songs that work well for every style of music covered in the lesson DVDs. Drum Play-Along 2 – DVD 18. Continuing on where the last DVD left off, this disc includes even more songs for you to play-along with. You’ll find more full-band tracks, and some that are pre-recorded in a studio.